The Expedition 40 trio waves goodbye to the Expedition 41 trio before closing the hatches to the Soyuz TMA-12M spacecraft. The trio undocked their Soyuz TMA-12M spacecraft at 7:01 p.m. EDT from the Poisk mini-research module, officially ending Expedition 40 and touched down with a parachute-assisted landing southeast of the remote town of Dzhezkazgan in Kazakhstan. During their time aboard the space station, the crew members participated in a variety of research focusing on Earth remote sensing, human behavior and performance and studies of bone and muscle physiology. They completed a record 82 hours of research in a single week in July. One of several key research focus areas during Expedition 40 was human health management for long duration space travel as NASA and Roscosmos prepare for two crew members to spend one year aboard the orbiting laboratory in 2015. 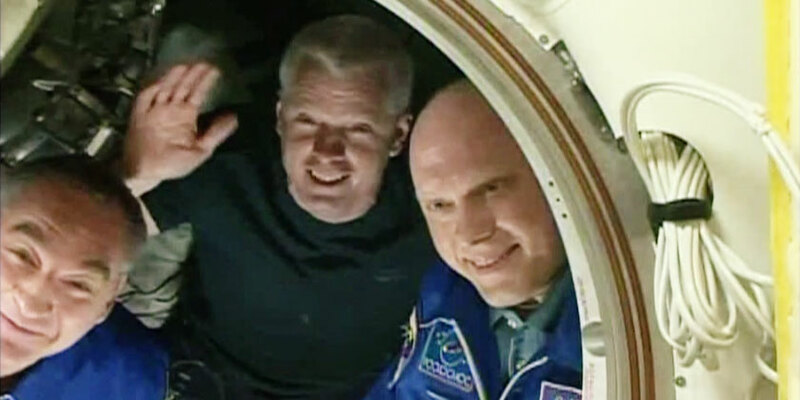 During their time on the station, the crew members orbited Earth more than 2,700 times, traveled more than 71.7 million miles and welcomed five cargo spacecraft. Two Russian ISS Progress cargo spacecraft docked to the station bringing tons of supplies in April and July. The fifth and final European Space Agency (ESA) Automated Transfer Vehicle also launched to the station in July with the spacecraft bearing the name of Belgian physicist Georges Lemaitre, who is considered the father of the big-bang theory. SpaceX launched a Dragon cargo spacecraft to the station in April, the company’s third of at least 12 planned commercial resupply missions. In July, Orbital Sciences’ Cygnus spacecraft completed its third of at least eight resupply missions scheduled through 2016 under NASA’s Commercial Resupply Services contract. During his time on the complex, Swanson ventured outside the confines of the space station for a spacewalk to replace a backup computer relay box that unexpectedly failed. Skvortsov and Artemyev conducted two spacewalks during Expedition 40, totaling 12 hours and 34 minutes. The space station is more than a scientific research platform. It also serves as a test bed to demonstrate new technology. Even routine tasks, such as monitoring and operating the carbon dioxide removal system, provides valuable data for next-generation life support systems. Carbon dioxide removal from the pressurized compartments of the station proved to work differently in space than predicted by ground tests. The crew also saw the arrival of the Haptics-1 experiment, part of an effort to develop technology that would allow an astronaut in orbit to control a robot as it explores its target, such as an asteroid or Mars, during future human exploration missions. Having completed his third space station mission, Swanson now has spent a total of 196 days in space. Skvortsov has accumulated 345 days in space on two flights, and Artemyev accrued 169 days in space on his first mission. Expedition 41 now is operating aboard the station with Max Suraev of Roscosmos in command. Suraev and his crewmates, Flight Engineers Reid Wiseman of NASA and Alexander Gerst of ESA, will tend to the station as a three-person crew until the arrival in two weeks of three new crew members: Barry Wilmore of NASA and Alexander Samokutyaev and Elena Serova of Roscosmos. Wilmore, Samokutyaev and Serova are scheduled to launch from Kazakhstan Thursday, September 25.